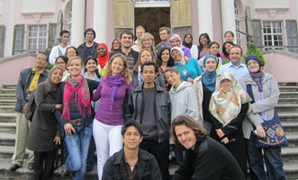 The 2nd Vienna International Christian-Islamic Summer University 2010 will take place in Stift Altenburg, a Benedictine monastery in Lower Austria from 4 to 24 July 2010. The monastery, also known for its “Garden of the Religions”, combines a unique atmosphere with the conveniences of a modern conference hotel. The Summer University will bring together more than 30 students from universities in Christian and Muslim countries. The three week programme consists of 9 main courses, afternoon workshops and evening talks. The professors come from the University of Vienna and from universities in other European and non-European countries. The courses in the field of law, theology and social sciences include topics like introduction to Islam and Christianity, interreligious dialogue, human rights and human freedom from the Muslim and the Christian perspectives, gender and religion, constitutionalism in a globalised world, religion and the State, religious pluralism, minority issues and others. In addition the programme includes excursions to Vienna and in the country side, evening programmes as well as sports and cultural activities.